One Legal — Can I pay using different credit cards for each transaction? You can select your preferred method of payment on a particular transaction from the Order Review screen of the workflow. Your card will be charged when the order is complete. You can also add a new credit card from this drop down and create a nickname for your card. No need to exit your transaction and add a new payment method in the Billing Center! 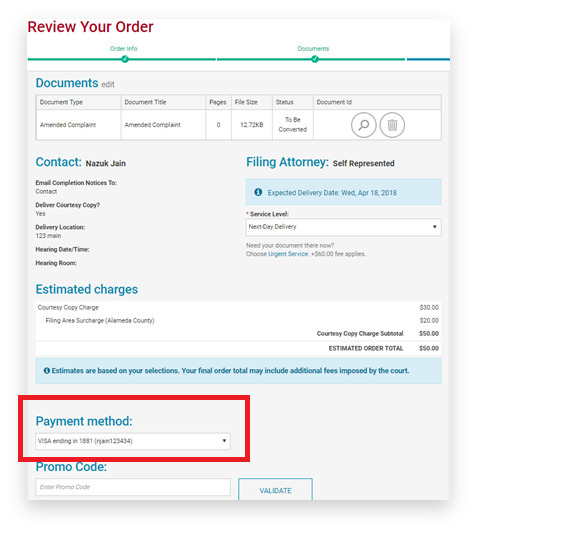 On the Order Review screen, you will see the Payment Method option near the bottom of the screen. You can also manage your payment options from within the Billing Center. To learn more on how to do so, click here.